The traveler and writer Marco Polo left Venice for Cathay (now China) in 1271, spent seventeen years in Kublai Khan's (1215–1294) empire, and returned to Venice in 1295. His account of his experiences is one of the most important travel documents ever written. Born into a noble family of Venetian merchants, Marco Polo began his long experience with Cathay through the adventures of his father, Niccolo, and his uncle, Maffeo Polo, partners in a trading operation at a time when Venice was the world leader in foreign commerce. The Polos had left Venice to travel all the way to Peking, China, and back when Marco was only six years old. During their nine-year absence, Marco was raised by his mother and other members of his extended family. He became a tough, loyal, observant young man, eager to please and interested in adventure. Marco Polo's father and uncle were well received in China by the Mongol prince Kublai Khan in 1266. The Polos impressed Kublai Khan with their intelligence and their knowledge of the world. For these reasons he kept them around for several years. In 1269 he sent them to Rome as his messengers with a request that the pope send one hundred Europeans to share their knowledge with him. Although the pope did not grant the request, the Polo brothers, in search of further profit and adventure, set out to return to China in 1271. Since his mother had died recently, Marco Polo was taken along on the trip, marking his debut, or first appearance, as a world traveler at age seventeen. The return to China, over land and sea, desert and mountain, took slightly more than three years. Despite their failure to bring back the one hundred Europeans from Rome, Kublai Khan welcomed the Polos back and again took them into his service. He became increasingly impressed with Marco Polo, who, like his father and uncle, demonstrated not only his ability to travel but also his knowledge of the Mongol language and his remarkable powers of observation. With the approval of Kublai Khan, the Polos began widespread trading ventures within his empire. While on these business trips around the empire, Marco Polo demonstrated his quick mind and his ability to relate what he saw in clear, understandable terms. His reports, which formed the basis of his famous account of his travels, contained information on local customs, business conditions, and events. It was in these reports that he displayed his talent as an objective and accurate observer. Kublai Khan read and used these reports to keep informed of developments within his empire. All three of the European visitors were kept on as messengers and advisers. The younger Polo was used on several extended missions that sent him traveling over much of China and even beyond. By his own account he came near the edge of Tibet and northern Burma. This relationship between the Polos and Kublai Khan lasted more than sixteen years, during which Marco served as Kublai Khan's personal representative in the city of Yangchow, China. Although the Polos enjoyed the profits of their enterprise, they longed to return to Venice to enjoy their wealth. They were prevented from returning for a time because Kublai Khan was unwilling to release them from his service. Their chance to return to Europe came in 1292, when they were sent on a mission to Persia and then to Rome. The assignment represented Kublai Khan's way of releasing them from their obligations to him. In Persia they were to arrange a marriage between one of Kublai Khan's regional rulers and a Mongol princess. They were forced to remain in Persia for nearly a year when the man who was supposed to be married died and a new groom had to be found. From the Persian court, the Venetians continued their journey home, arriving in 1295 after an absence of nearly twenty-five years. Marco Polo did not return to Asia again. He entered the service of Venice in its war against the rival city-state of Genoa. In 1298 Marco served as a gentleman-commander of a ship in the Venetian navy. In September 1298 he was captured and imprisoned in Genoa. He was famous for his adventures, and as a result he was treated with unusual courtesy for a prisoner and released within a year. Little is known of Marco Polo's life after his return to Venice. He apparently returned to private life and business until his death in 1324. While imprisoned in Genoa, Marco Polo related the story of his travels to a fellow prisoner named Rusticiano, a man from Pisa, Italy, who wrote in the romantic style of thirteenth-century literature. 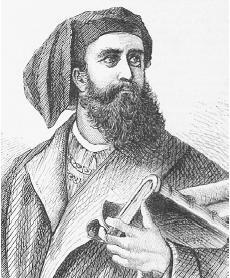 A combination of Marco Polo's gift of observation and the writing style of Rusticiano emerged in the final version of Marco Polo's travels. The book included Polo's personal remembrances as well as stories related to him by others. In his book, which was translated into many languages, Polo left a wealth of information. The information contained in his maps has proved remarkably accurate when tested by modern methods. His observations about customs and local characteristics have also been proven true by research. Collis, Maurice. Marco Polo. London: Faber and Faber, 1950. Larner, John. Marco Polo and the Discovery of the World. New Haven, CT: Yale University Press, 1999. Latham, Ronald. The Travels of Marco Polo. Middlesex, England: Penguin Books, 1958. Stefoff, Rebecca. Marco Polo and the Medieval Explorers. New York: Chelsea House Publishers, 1992. I think that the biography should describe Marco Polo's appearances but over all, the biography was good. i think that this website should include more details in this website. This website is very good. the only thing it is mainly missing is that you should include his family in his biography and should tell us if his family has any emperors or something like that. I wish it could tll us any books that he wrote are still readable to this day. this website has really good information to use for like a report or something but it should tell more things about the person no matter who it is. i think that marco polo has an interesting teenage years and he traveled with his parents alot.i wishb all of this information could be wraped up and put in a book. I'm actually using this for research (who isn't?) and I could get some use out of this biography. Not the most useful, though. I wish I would've included more on his book, because other than his travels, that's the thing he's famous for.